One of the earliest recorded statements about diamonds is: “the substance that possesses the greatest value, not only among the precious stones, but of all human possessions.” said by Pliny, the Roman historian. The story of the diamond cut is the story of humankind’s love of diamonds and our quest to unlock their true brilliance. The Romans loved diamonds but did not have the technology to change their shape. So, the Romans wore uncut diamonds. 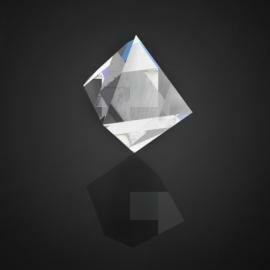 One of diamond’s remarkable attributes is that the natural diamond crystal is beautiful without any human modification. Diamonds normally form in the octahedral shape which looks like two pyramids stuck together at the base. Naturally, the first attempts to enhance diamonds were to polish the natural gem. The “point cut” is the polishing of a natural octahedral diamond. Interesting fact #1 about diamond cuts: cutting a gem is the shaping of a gem while polishing is making the facets smooth and shiny. Diamonds are cut and polished in one step. Since only diamond can cut diamond, the diamond cutter must take care to polish the gem at the same time. That is one of the reasons diamonds are expensive. Diamond cutters are highly trained and need a lot of experience to get the job done right. 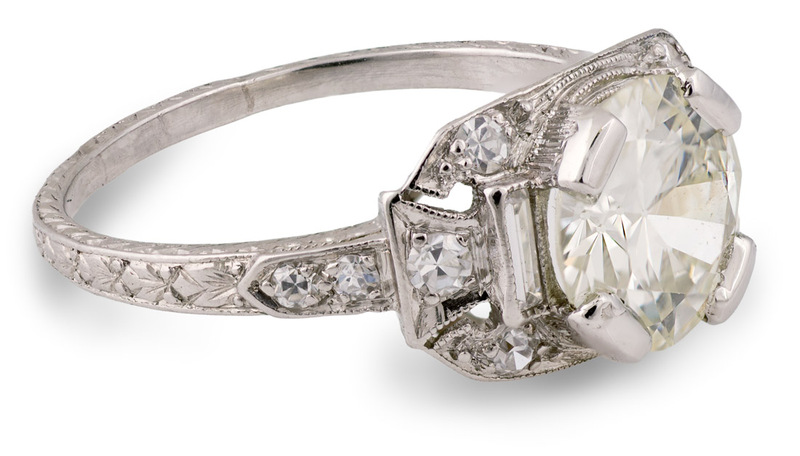 The point cut diamond is likely where the tradition of the diamond engagement ring began. 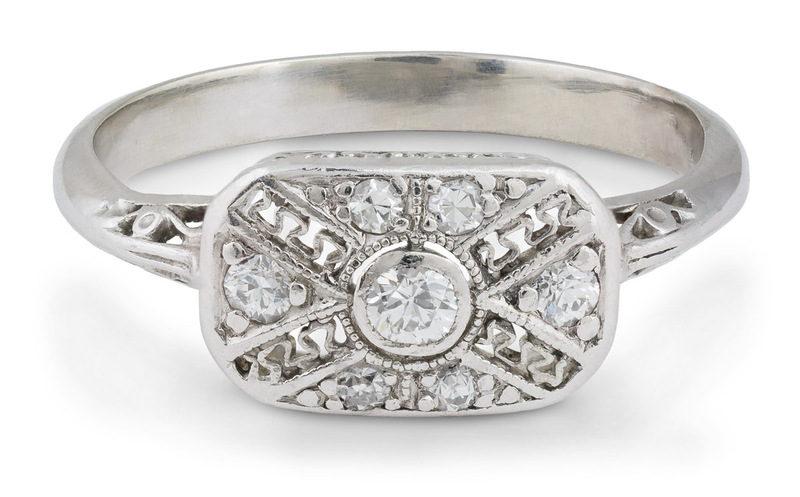 Mary of Burgundy became the first to receive a diamond engagement ring. Archduke Maximilian of Austria gave her a ring that was set with a point cut diamond and thin flat pieces of diamonds in the shape of an “M” in 1477. Once it was understood that only diamond can cut diamond the process of changing the shape of a diamond began. In the 15th century cutters would saw off part of the octahedron to create what is called a table. The table is the big center facet of a diamond. The creative name for this shape is the Table Cut. By adding more facets to the diamond crystal the single cut diamond was born. The Single Cut diamond is one of the earliest and most basic of cuts. 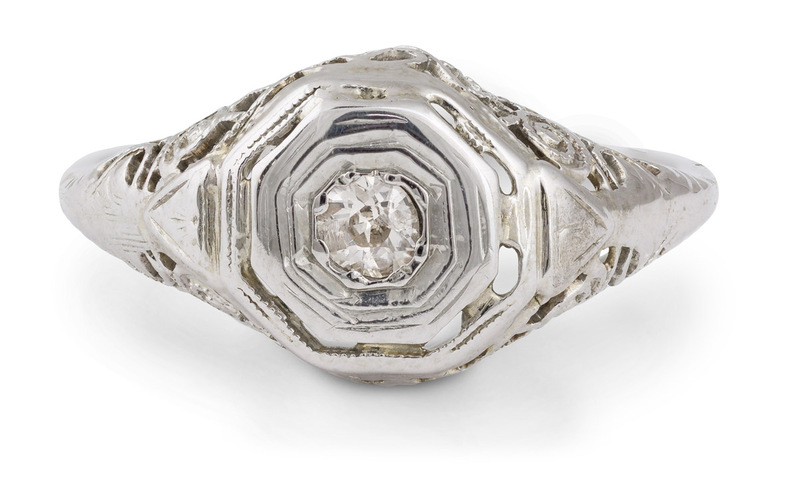 It has an octagonal girdle (the side edge of the diamond) with a table and eight crown (top part of the diamond) facets plus eight pavilion (the bottom part of the diamond) facets plus a culet (the point at the bottom of the diamond). Diamonds have gone from one facet (the table) to 18 facets. This cut started to unlock the brilliance within the diamond, and variations of it are still used today. Another early diamond cut is the rose cut or rosette cut. The rose cut looks like half a diamond to modern eyes. It has anywhere from 3 to 24 facets coming to a point in the middle. But its most recognized aspect is the flat bottom. Basically, it is a crown without a pavilion. Interesting fact #2: Some diamond cuts do not have a standard number of facets. As we have just seen the rose cut has many variations. A 3 facet rose cut looks a lot different than a 24 facet rose cut. Some cuts can vary by multiple facets and still be considered properly cut. With other cuts even changing 1 facet would result in the diamond being labeled a miss-cut (often causing it to be sold at a discounted price). It just depends on the type of cut and where the deviation from the “standard” facet pattern is. The next important diamond cut is the French cut. The French cut is a square or rectangular cut diamond. It appears square when viewed from above because it is based off the octahedral shape of the natural diamond. The French cut has just 9 crown facets, with the square or rhombus-shaped table facet diagonal to the square of the crown. At the four sides of the table are four triangle facets that point towards the corners of the crown. This gives the appearance of a four-pointed star. The pavilion is cut into four main facets. The Mazarin cut diamond was a big step forward. The evolution of the diamond cuts then takes a big leap with the Mazarin cut. The Mazarin cut also known as the “Brilliant en seize” or “The Brilliant in Sixteen” and also as Lisbon Cut is accepted as the first brilliant cut diamond. 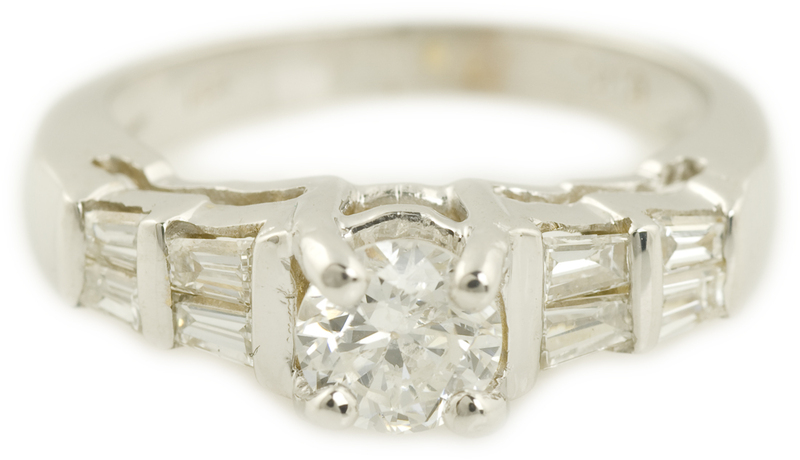 Interesting fact #3: the same or almost the same diamond cut can be known by different names. This is done in the modern era is for branding and marketing reasons to increase the perceived value of the diamond. In historical times, it was most likely for national and regional reasons. The unfortunate result of this in both the past and present is that it makes diamonds that much harder to understand. That’s why we at Arden Jewelers always strive to use standard, easy to understand names instead of complicated industry jargon or marketing names. Our goal is to demystify diamonds and jewelry not add to the confusion. The Mazarin cut has 17 facets on the crown. Yet another name for this cut is the double-cut brilliant because they have double the facets of the single cut diamond. And if double is good, then triple is even better. The Triple cut or Peruzzi brilliant cut is another adaptation. The triple cut has 33 facets on the crown. When most people think of old diamond cuts they think of the Old Mine cut diamond. The Old Mine cut has the same number of facets as a modern round brilliant (a total of 58). The Old Mine cut’s distinctive features are the high crown angle, small table, large culet and square rounded corner shape. The reason for the cutting style is more about sticking close to the natural diamond octahedral shape than the release of fire and brilliance we know today. The Old Mine cut follows the angles and shape of the octahedral diamond crystal to save on weight from the rough stone and to make it easier to cut with the diamond cutting technology of the day. Old Mine cut diamonds range from almost square with rounded corners, to irregular shape, to round. Some call the irregular shape cut a crude Old Mine cut. Old Mine cut is the last cut where individual cutters took liberty with how the facets are laid out. Some look like a modern round brilliant (in layout, not in angles or shapes) and others follow a design of their own creation. The Old European cut is the forerunner of the modern Brilliant Cut. The 58 facets have the same general shape, angle and layout as the modern brilliant cut. The old European cut is credited to an American cutter names Henry Morse in the late 1800’s. Why is it not known as the Old American cut instead of the Old European cut? Maybe diamond sellers at the time thought their customers would be willing to pay more for something European than they would for something American. The Old European cut has a smaller table, higher crown angle, and a larger culet than the modern round brilliant cut. 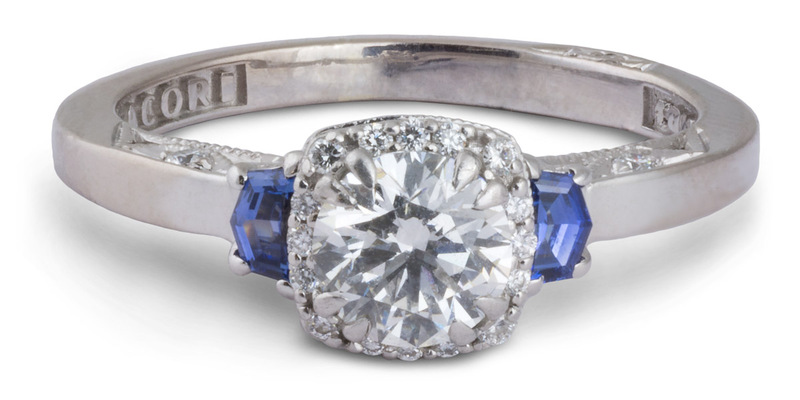 The modern round brilliant cut is designed to push its fire and brilliance up through the middle of the stone. On the other hand, the Old European cut looks less brilliant from the top down view but its fire and brilliance explodes from the sides of the crown in a dome effect. The Old European cut diamonds generally have the proper pavilion angle which is like the engine for the brilliance of a diamond. The crown, by contrast, is like a lens focusing the light show of a diamond. So, the Old European cut diamonds create the brilliance but do not concentrate the show straight up. Instead, they show it in a dome effect. 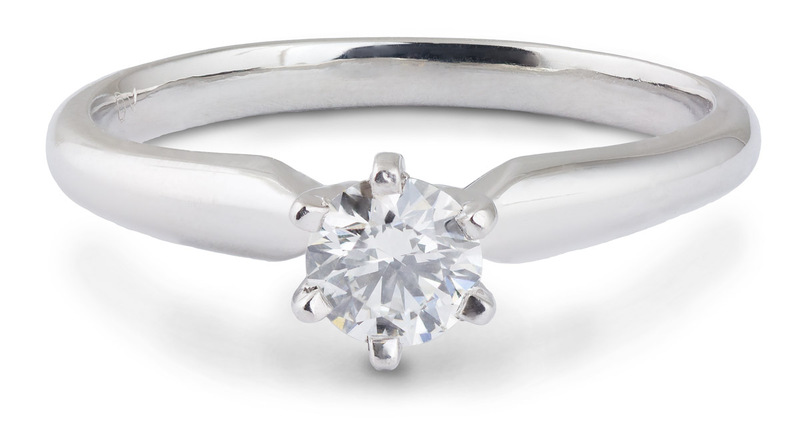 The stunning modern round brilliant cut diamond. Now, we are nearing the end of our journey through the history of diamond cuts. The modern round brilliant cut is a product of math and science. Marcel Tolkowsky analyzed diamond brilliance in the way they take white light and break it into its spectral hues and direct it to impress the wearer. Tolkowsky’s calculations serve as the basis for the modern round brilliant. Since its creation subtle and not so subtle variations on the round brilliant have come and gone each claiming to surpass it in some way. None have captured our imagination or hearts the way the modern round brilliant has. It has been and remains the most frequently chosen diamond cut for engagement rings and other jewelry. 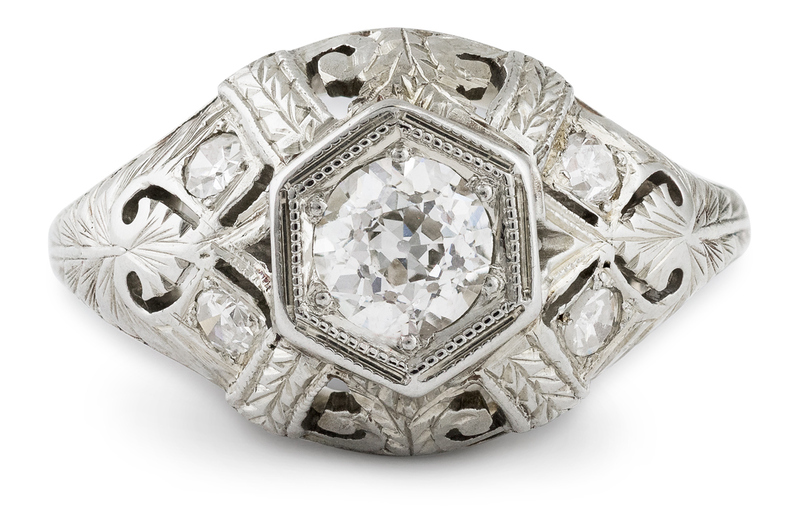 We hope you have enjoyed this exploration of diamond history. What’s your favorite old diamond cut? Let us know in the comments below, and stop by the shop to see real life examples of these beautiful pieces of the past and present. Very interesting! I love learning about gems and jewelry almost as much as I love wearing it! How Are Lab Grown Diamonds Made?